Teacher trainees will also take yoga classes in between our weekends for self-care and self-study (a Yoga Farm membership with unlimited yoga classes is included in the tuition). What is yoga? Exploration of Karma, Bhakti, Hatha, Jnana, and Laya yoga. Seva Seva as a lifestyle and giving. Deliver a service project in the community as part of training. Understand the ethics of the profession. Discuss boundaries, lineage and tradition. Understand the Guru tattva principle. Where does yoga come from and how is it transmitted? Personal approaches to living the principles of yoga. Discuss decolonizing yoga, accessibility and welcoming, opening practices to all. Discover and discuss the roots of yoga, cultural appropriations, roots in Hinduism, and broadening accessibility into Western culture and religion without losing the essence of yoga. Group discussion of the yoga sutras, yamas, and niyamas. Discuss posture adjustments and assists, props and modifications. 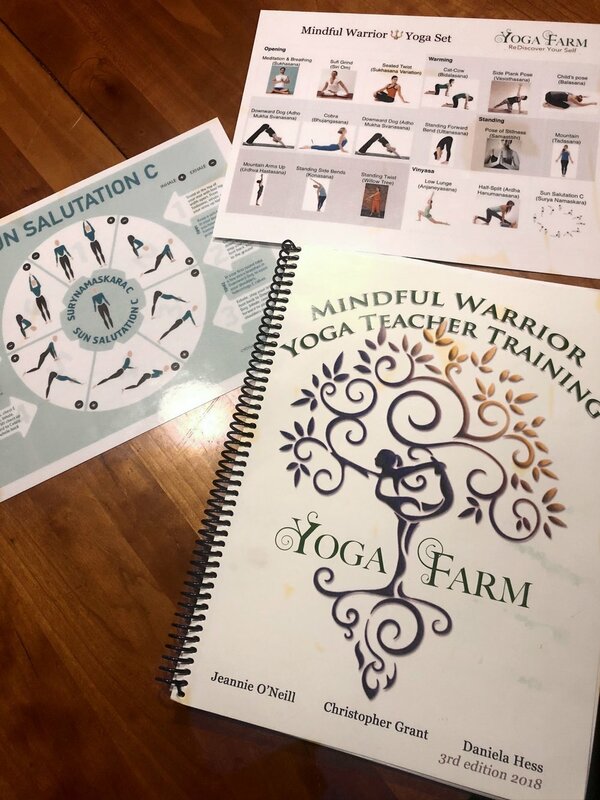 Practice and conduct detailed study of the poses in the Mindful Warrior yoga set. Watch and learn from videos of the poses in the Mindful Warrior yoga set. Chant together as a group. Experience Bhakti yoga. Inquiry In our core philosophy we teach meditation, contemplation and inquiry. Inquiry is the process of asking good questions of oneself, uncovering, limiting beliefs and questioning those beliefs. Meditation Practice meditation in a variety of methods. Mindfulness Discuss mindfulness as a gateway to awareness and meditation. Explore mindful eating and walking, as well as mindfulness in schools and outside of yoga studios. Learn about the two essential wings of yoga: Abhaysa and Vairagya. RAIN Discuss inquiry in the world. Practice teaching core postures and backbends. Practice teaching the standing poses in our Mindful Warrior set. Practice teaching Sun Salutation "C."
Kriyas Discuss cleansing and purifying the body and mind. Discuss the basic arc of a class and the importance of sequencing. Discuss how to teach beginners. Learn about approach, intention, and invocation. Understand the private lesson structure. Discuss the basics of teaching and voice: speaking with confidence, using repetition of core concepts, connecting with different learning styles, and how to balance challenge with ease. Learn to teach, rather than do, yoga. Discussion of maintaining your practice, practicing the set(s) before class, watching, listening to, and staying with the students in the room. Learn tools to become a yoga professional. Connect to your authentic voice and integrity. How to plan for classes. Overview of teaching to special populations. Observing Observe two yoga classes. Fundamentals and the big picture. The feet and lower leg. Teach half a class (observed). Teach class to friends, family, or fellow students. Teach full class, observed by lead trainer, with directed feedback afterwards. Teach full class as part of final testing.